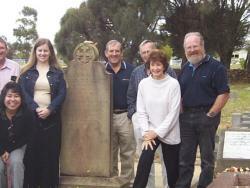 To celebrate William Barlow's 200th birthday, a number of his descendants headed to Swansea to view his grave stone which is situated in the Anglican Cemetery, on the shores of Great Oyster Bay. We decided that as a special birthday present we would investigate having the sandstone memorial repaired. It is in surprisingly good condition having stood beside the sea for some 120 years. The inscription is worn and barely decipherable now although we do have a record of the text. After leaving the cemetery we headed down the East Coast to lunch at a fabulous restaurant, Kabuki by the Sea, built on the side of a hill and overlooking Schouten Island to the north and Maria Island in the distance to the south. This gave everyone a chance to chat and catch up on news of the past two years, fill up on Japanese food and admire the views. Congratulations to John for his excellent taste in restaurants! As luck would have it whilst we were having lunch, Lance literally ran into the current owner of "The Hermitage" which was to be our next stop on the whirlwhind WB tour. So all aboard the bus for the next stop, some 40 kms south of Swansea, William Barlow's property in the 1870's. The cottage looks slightly different now that the second story section has been removed. The new owner is interested in stonework and is intending to repair the house. It was a terrific experience for us all to wander around the property and see where William spent his last years. Quite a lot of discussion went on about how we could return some of the original property to Barlow descendants and it was decided Lance and John would investigate the idea a bit further. Next stop was Bolton's Beach (hopefully to be re-named Barlow's Beach at a later date), just a short drive from "The Hermitage" where Brian's camera captured an "unidentified" wanderer who was looking for his long lost cousins. Judging by the photo he was happy to find us! On Sunday we were treated to another great day, this time at Mary's house for a BBQ lunch and an opportunity to share stories, photos and other bits and pieces. This time we were joined by some Cooley descendants, Clive and Rob. Hopefully next time we have a reunion we can contact some more Cooley's and invite them to join us. I know there are lots of them lurking around Tassie, Victoria and New Zealand as I've had the pleasure of talking to a number of them in the past months. Thanks to everyone for once again making this a great reunion, let's hope we can have many more.